2. Copy the contents of the archive to the root folder of the website on your server. 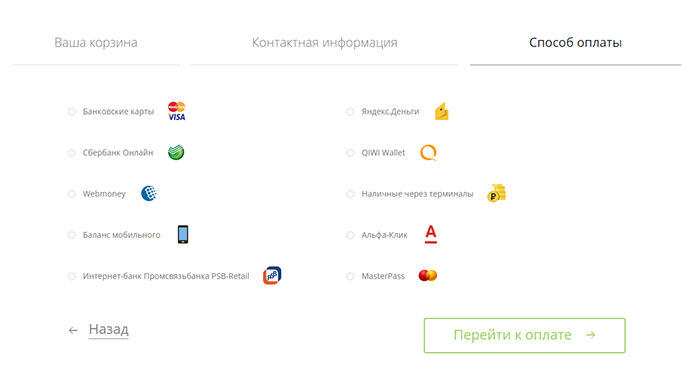 Settings of the first scenario: selecting the payment method on the Yandex.Checkout's side. 1. Select Settings in the website's dashboard, then the Payment tab. Click Add payment method. 2. Enter "Yandex.Checkout" in the top line of the panel for adding a new payment method. Check the Active box to the right of the line. 3. Select "Yandex.Checkout 2.0" in the drop-down menu. 4. Fill out the shopId and Secret key fields: you can get both parameters in your Yandex.Checkout Merchant Profile. 5. Set On Yandex.Checkout's side in the Payment method selection column. 6. If you configured the transmission of receipts to the Tax service via Yandex.Checkout partner services (in accordance with Federal Law No. 54-FZ), enable the transmission of receipt data, then indicate the VAT rate to be specified in your receipts. 7. Click Save. That's it, now you can test payment acceptance. Settings of the second scenario: selecting the payment method on the store's side. 5. Set On the store's side in the Payment method selection column. 6. Select payment methods indicated in your contract with Yandex.Checkout in the Payment method column. 7. If you configured the transmission of receipts to the Tax service via Yandex.Checkout partner services (in accordance with Federal Law No. 54-FZ), enable the transmission of receipt data, then indicate the VAT rate to be specified in your receipts. 9. Repeat steps 1 to 8 for each payment method indicated in your contract with Yandex.Checkout.